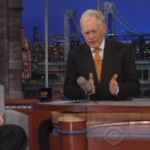 From Mediaite: Fox News host Bill O’Reilly appeared on David Letterman’s show last evening. Mediaite reports on the segment, which took a political turn. The site writes, “From drones to gun control, the pair discussed recent controversies and debates, with Letterman not always buying the views O’Reilly was selling.Letterman first asked about President Obama‘s drone program, which has elicited a great deal of controversy recently. Some ‘civilian oversight’ would help, O’Reilly noted, but he supports the program. Some of the outrage, he said, comes from the fact that liberals were vehemently outspoken against waterboarding, which didn’t kill anyone, yet there’s not quite the same reaction to drones, which are ‘wiping out villages. '” Read on and watch video here. From Gossip Cop: Jennifer Lawrence’s press interviews always promise some gem quotes. Gossip Cop reports on the latest, saying the actress “sat down with ‘Nightline’ for a special Oscars edition, in which the actress talked about remaining grounded, her aversion to partying and stalking Meryl Streep at a party. Asked how she maintains her self-awareness in Hollywood, the Best Actress nominee explained, ‘I just have a very weird job, and if I just remind myself of that, that it’s nothing more than that, then I don’t start… thinking that it’s more dramatic.’ Lawrence also talked about being discovered by a talent scout in New York at age 14 saying, ‘It was the first time in my entire life that I felt like I 100% was made for something, and that I could be good at something, and that I understood something, because I spent so many years being lost in school and feeling stupid. '” Read more here. From Geekosystem: Today is a holiday, and not Mardi Gras, says Geekosystem. Writes the site, “Happy Darwin Day, everyone! 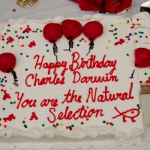 OK, we know it’s a relatively new thing and still catching on, but we are big fans of celebrating the February 12 birthday of naturalist Charles Darwin. It’s a day to be thankful for innovative thinkers, brave scientists of all stripes, and yes, evolution in general, because frankly, we take our opposable thumbs for granted 364 days of the year, and respect should be paid. If you’re looking for something to do in your neck of the woods to celebrate among like-minded lovers of evolution, the International Darwin Day Foundation has a guide to events at colleges, libraries and museums around the world that will be celebrating the life and work of Charles Darwin in the coming days.” Read about them here. From Styleite: Betsey Johnson always brightens up the Fashion Week runway with her quirkiness. Styleite reports on her performance this year: “In late January, Betsey Johnson announced her return to the official New York Fashion Weekschedule, and while we all knew that the designer would end her show with her signature cartwheel, we certainly didn’t expect a mini-exercise routine as well. Johnson debuted her activewear line, BJ Kicks A, early yesterday evening at Lincoln Center, and like all things Bestey, this was not your regular runway. Well, the clothes were classic Betsey — pink, prints, and obviously lots of tulle — but with a much more athletic appeal to them. After the models strutted down the runway, which was lined with yoga mats, the designer herself came out to exercise with her girls.” Read more here. From SportsGrid: Today is a bad day for creepy coaches, declares SportsGrid. Explains the site, “As of January 24th, Kevin Hadsell is no longer employed by the University of Toledo. 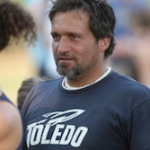 In a story on Deadspin earlier this morning, Hadsell’s resignation from his former post as director of the University’s men’s and women’s cross country team, as well as director of the women’s track program, stems from allegations of sexual harassment by one his female runners – and the story reveals a pattern of manipulative abuse of his power through relationships, often sexual in nature, with his athletes… But Hadsell isn’t the only member of today’s creepy coaches club: Zachary Reeder, a baseball coach at Beckman High School in Irvine, California for the last four years, was arrested over the weekend for posing as a blonde female on Facebook and soliciting explicit photos from underage teenage boy.” Read the full story here. From The Mary Sue: Sunday night was a big night on TV, and The Mary Sue reports on the winner: “Looks like people were really craving some zombie action. 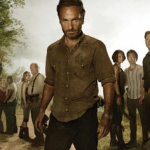 The midseason premiere of AMC’sThe Walking Dead drew in huge viewership on Sunday despite airing at the same time as the Grammy Awards and Downton Abbey. The Walking Dead is on a roll. Their Season 2 finale broke records for AMC and back in October last year, Season 3 broke that record with 10.9 million viewers. Care to take a stab at the new number? Sunday’s episode (read our recap here) brought in 12.3 million. Collider writes, ‘The episode also proved strong in the coveted 18-49 demo, garnering 7.7 million viewers with the key demographic. In fact, the series average for the 18-49 demo is higher than those of network hits like Modern Family, NCIS, and even The Big Bang Theory. '” Read on here. From The Jane Dough: Tonight, President Obama will address the nation during the first State of the Union of his second presidential term. And The Jane Dough is reporting on the coolest seats in the house. 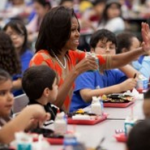 Writes the site’s Sarah Devlin, “Everyone wants to sit with Michelle at the State of the Union tonight. Did she ask you to sit with her? I sat by her last time, so. Last year Steve Jobs’s widow Laurene Powell Jobs got to sit with Michelle and this year it’s Apple CEO Tim Cook. This is the second year in a row that someone from Apple will be sitting with Michelle. Do you know anyone else who got to sit with her two years in a row? Besides me, I mean.” Read a list of the First Lady’s attendees for the event, which includes the Oregon governor and a 102-year-old Hatian immigrant, here. From The Braiser: BAM! 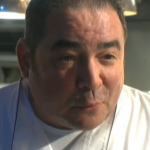 Just like that, celebrity chef Emeril Lagasse’s rockstar days were over. The Braiser explains how and why, “Depending on your level of Emeril Lagasse fandom, you may or may not know that, before his culinary star rose, he was a talented high school percussionist who had been accepted at the New England Conservatory of Music.In a brief Q&A with ABC News about his favorite things, Emeril opened up about his hidden talent and revealed his difficulty in switching life paths. ‘When I wanted to become a chef, it was a very tough decision because as a young boy, I was blessed,’ he admitted. ‘I had music talents so I played a lot of music and I actually turned down a music scholarship to pay to go to cooking school.’ Don’t fret, Em. We’re sure someone in New Orleans will let you join their Mardi Gras drumline today. It’s still early!” Read more here.